It should come as no surprise that PCT Days would be something that I’d like. It’s a PCT festival after all. This is my third or fourth PCT Days but the first one where I didn’t camp. I’ve been traveling a whole lot, and have been generally a bit stressed out with so much going on. When I saw that heavy rain was forecast, the first time in at least six months, I decided to book a last minute hotel room. It also helped keep the electronics that I needed for work charged and me showered and a bit more presentable. Again, since this was a work event, I’ll write about it at my work’s website later. Probably this week. I won a pair of Danner boots in the raffle. I’d been lusting after a pair of their shoes for a year or two, but they were far out of my price range. Winning a pair was a real coup. I ended up squeezing in a stop at their store before my flight home and now I’m the owner of a fancy new pair of shoes. 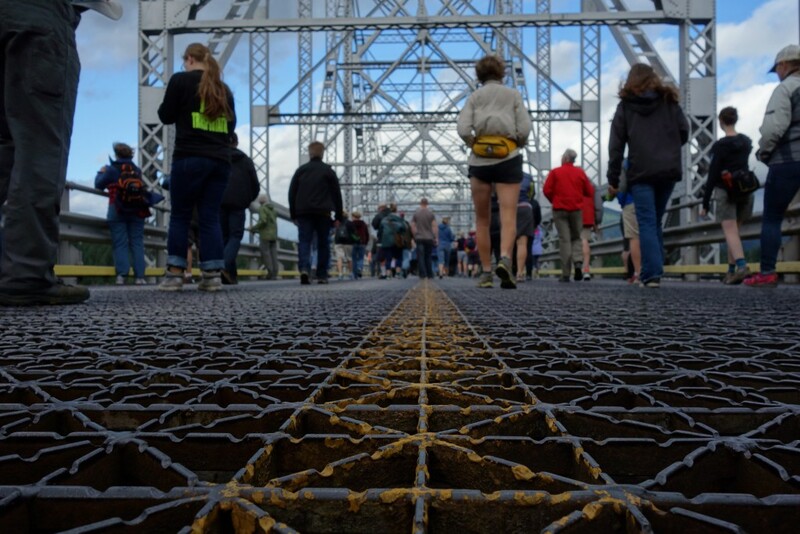 Bridge Walk, when we close the Bridge of the Gods to cars and invite the community to enjoy it, was also a huge success. We’re building support to build a non-motorized path on the bridge. It felt like we nearly filled the bridge to capacity with a wide cross section of people. It’s oh-so-great to talk to people that are passionate about the PCT. I work for the PCT day-in, day-out and it’s incredibly necessary to spend some time with people that are inspired by the trail. I spent time with friends and met a whole bunch of new people too. This trail brings together some really wonderful people. It was busy and fun. The rain was really enjoyable. It came mostly at night, and in short, heavy waves. We hosted Dan Ogden and Jean Mathews at our booth. They were key people behind the National Trails System, Wilderness Act, Wild and Scenic Rivers, Land and Water Conservation Fund and so many other things of incredible importance. Dan’s love of the PCT, at 93, and his genuine interest in how “his” project is going, was very moving. I’m glad that I got to spend time with them. I got a tour of Thunder Island Brewing and got to spend some time there with good friends. I was especially excited to hang out with Thyra, the volunteer that manages our Instagram. All in all, PCT Days was a fantastic success in my mind. Turnout was much higher than in years past. More vendors showed up (and gave away incredible amounts of quality gear to everyone). And, the vibe is one of a small community of friendly, passionate people.